Barack Obama’s embarrassing new attempt to channel Harry Truman with his angry populist appeals is doomed to failure for three reasons: wrong guy, wrong Congress and wrong country. Wrong Guy. Everything about the real Harry Truman made him a perfect representative of the little guy: his slight stature, humble boyhood on a Missouri farm, lack of formal education (he was the last president with no college degree), checkered business career, small-time and small-town associates and well-known habit of plain speaking. When he became the accidental president after FDR’s sudden death in 1945, establishment journalists compared him unfavorably against Roosevelt’s worldly sophistication and aristocratic style. 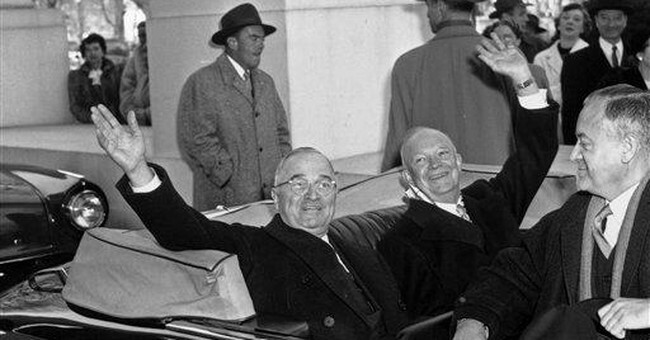 Truman made his rough-hewn Missouri-stubbornness into a virtue when he faced the electorate in his underdog campaign in 1948, connecting far more effectively with ordinary, middle class Americans than his opponents - the mustachioed New York governor, Thomas E. Dewey and the suave, handsome third-party leftist, former Vice President Henry Wallace. Obama has virtually nothing in common with Truman - other than their comparable experience of failure in promoting a sweeping new government health care program. The current president is an athletic 6’2”, with two prestigious Ivy League degrees, cosmopolitan tastes and vast personal wealth (earned largely from his bestselling books). He never attended American public schools, receiving his education either in Indonesia or, since fifth grade, at a posh, top-rated prep school (Punahou) in Hawaii. Where Truman’s father John Anderson Peanuts Truman (who measured all of 5’4” and 140 pounds) was a poor farmer and livestock salesman, both Obama’s parents held graduate degrees (his mother a PhD in anthropology and his father an economics MA from Harvard) and he was raised by his banker grandmother, for thirty years a Vice President of Bank of Hawaii. His wife Michelle, of course, holds blue-chip degrees from both Harvard and Princeton and earned close to a half-million a year in her career as a corporate attorney. While most Americans remain ignorant of the details of Obama’s privileged background, they know that his attempts to portray himself as just plain folks ring phony and fraudulent. When he first assumed the presidency, his admirers tried to liken him to John F. Kennedy - an analogy that actually made some sense. Both men were tall, slender, preternaturally cool, expensively groomed, deeply narcissistic Ivy Leaguers who made up in glamour what they lacked in the common touch. It’s an idiotic strategy, however, to try to morph the suave, teleprompter-addicted No-Drama Obama into the fiery Give ‘Em Hell Harry. It makes about as much sense as trying to transform George W. Bush into the wry, philosopher king egg-head, Adlai Stevenson. Wrong Congress. In November of 1946, after just nineteen months as president, Harry Truman received a devastating political blow that made Obama’s recent message from Massachusetts look like a love-tap. Under Truman, the resurgent Republicans captured 13 new Senate seats and 56 fresh places in the House, giving them control of Congress for the first time in 16 years. As it happened, Truman turned this huge political defeat into a major electoral advantage when he campaigned for president two years later: he ran a feisty, indignant race blaming all the nation’s problems on The Do-Nothing Republican Congress and accusing his opponents of trying to dismantle FDR’s popular New Deal. It's obviously tempting for Barack Obama to similarly blame the struggling economy and his foreign policy reverses on the pompous insiders on Capitol Hill; after all, public opinion polls show that Congress is even less popular than he is. The problem, of course, is that the president’s own Democratic Party enjoys big majorities in both houses, and even with Scott Brown’s upset in Massachusetts, the Republicans still control nothing at all in the legislative branch. He may feel frustrated about his own Do Nothing Congress but attacking fellow-Democrats Nancy Pelosi and Harry Reid (as either incompetent or malfeasant) wont help make the case for electing still more Democrats in November. Angry populist rhetoric could work for President Truman in 1948 because the people had just gone through two years of the novel (and, as it turned out, short-lived) experience of GOP control of Congress. If Barack Obama, on the other hand, tries to exploit widespread anger at the current direction of government, it’s hard to see how the rage wouldn’t finally focus on the president and his allies. THE WRONG COUNTRY. Impassioned efforts to bash business and demonize corporate power have rarely paid off in the past (just ask three-time presidential loser William Jennings Bryan or more recent flailing, failing demagogues like George McGovern, Walter Mondale, or John Edwards) and they certainly wont work today. It’s true that Truman eked out his 1948 upset victory (49% to 45%) by claiming to represent common people against the Washington and Wall Street establishments, but with two prominent fringe party candidates he still fell short of a majority. What’s more, the nation has changed dramatically in the last sixty years, making the electorate far less susceptible to us-vs.-them, working class-vs.-ruling class appeals. For one thing, labor unions played a vastly greater role in elections at every level: in 1948, 28% of the civilian labor force affiliated with unions while today the number is less than 12%. Far more Americans own their own businesses in 2010 than hold union cards. What’s more, the old denunciations of Wall Street carry less political force when a clear majority of Americans (an estimated 55%) own shares in the stock market compared with just 4% in 1950! In the Truman era, denunciations of greedy financiers (like FDR’s economic royalists) threatened mostly them, but in today’s America any damage to the Dow Jones definitely impacts us, causing pain and loss for most (if not all) American families. Even many citizens with no stock portfolios understand that if big business suffers and declines, then their own jobs are on the line. Could any observers of today’s economic dilemma believe that we will achieve a durable recovery if leading corporations and major banks don’t play a prominent role in it? The recent foray into faux populism by the President of the United States reflects an administration in the midst of unraveling, its magical mantras of hope and change irretrievably tarnished, and its gauzy promises of a new golden age of bi-partisan cooperation looking more and more like a sour joke. President Obama understands that he needs to project a fresh start on health care, terrorism, spending, deficits, the economy, energy policy and more, but he prefers to experiment with an ill-fitting image adjustment, based on the success of one of his embattled predecessors. He may make vain attempts to impersonate Harry Truman, but the combination of mindless big government policies and feckless, self-righteous leadership increasingly bring to mind his deeper resemblance to Jimmy Carter.